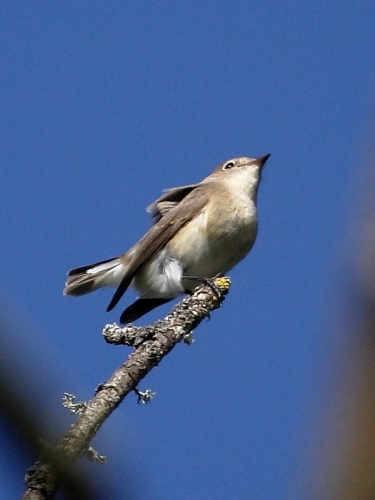 This tiny flycatcher of between 11 and 12cms in length has been present in the Kenidjack valley, on the Cornish Atlantic coast near Land’s End, for several days now. 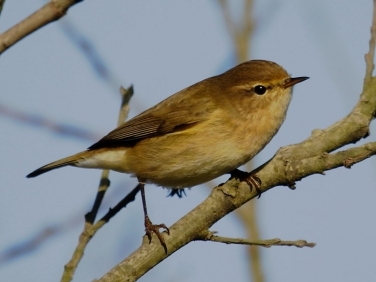 When we were there it was feeding on insects in a small copse of trees beside the track leading down to the sea. Several similarly sized Chiffchaff were also feeding in the same trees and it was interesting to see how, at times, the Red-breasted Flycatcher shared similar dashing movements to these warblers as it flitted amongst the branches. Unlike the two breeding flycatchers more commonly seen in the British Isles, the Spotted Flycatcher and Pied Flycatcher, Red-breasted Flycatchers don’t appear to spend as much time perching prominently out on a branch waiting for an insect to pass by. Instead, in common with warblers, it seems to be far more proactive in searching out its food and frequently on the move. Despite its behaviour, size and general non-descript brown and pale colouring appearing similar to that of many warblers at a distance the identification of this 1st winter Red-breasted Flycatcher was fairly straightforward. Even when seen as just a dark silhouette flitting about through branches its more rounded head and small bill came across as different to the more sharp features of a warbler. However, what was an identification giveaway was its habit of cocking its tail when perching. This characteristic behaviour can be seen from the image above. Despite not being the greatest of shots and stretching the capabilities of a 400mm lens, it does show the diagnostic black tipped and white panels of the raised tail quite well, even from the underside. 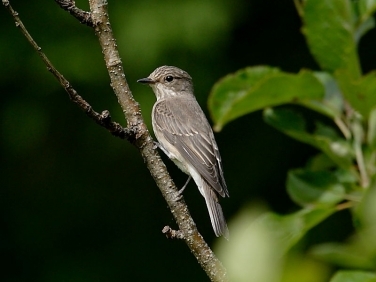 Comparison images of first winter Spotted Flycatcher, Pied flycatcher and wintering Chiffchaff are shown to the right and below. Of course, the identification would have been even simpler if the bird had been a mature summer plumaged male with a fine orangy-red upper breast and bluey-grey head- but then that’s birding! It would also have been appreciated if it had posed a few feet from me for ten minutes, on an open branch, in the sunlight and without moving – but then that’s bird photography. Other bird photographers were much more patient and managed much better images – but then that’s just lucky! My excuse – I wanted photos of the Wryneck at Land’s End – don’t ask! The Red-breasted Flycatcher is an annual summer visitor to the UK in very small numbers. It winters in West Asia and moves into northern and Western Europe to breed in the summer. It feeds on insects, nests in holes and bark crevices and seems to favour deciduous woodland but may be found in a variety of habitats. 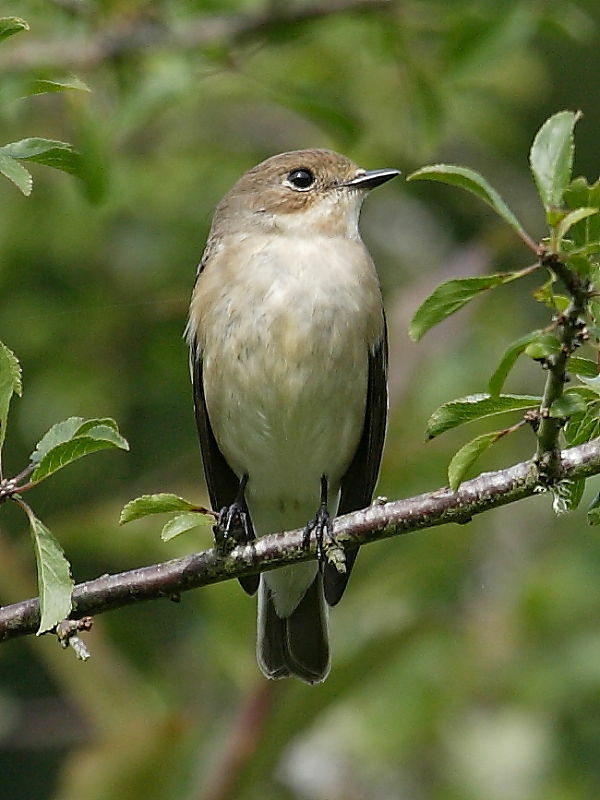 The extremely rare vagrant to the UK , the Brown Flycatcher, is always worth considering when identifying flycatchers. Maybe, more in hope but you never know!